Do you like to repurpose or upcycle items, that you already have, in your craft projects? Most of the time, when we think about repurposing, we think about throw away items like wine corks, cans or bottles. However, have you ever thought about your old jewelry? Old jewelry crafts can be the most fun because of all that bling available! I’ll show you what to make with old jewelry from accessories to home decor. So, maybe it’s time to clean out your jewelry box and make something with the pieces that you are no longer wearing. This is a great way to upcycle and you won’t feel guilty for just letting that collection of trinkets lay there unused and forgotten. And, since money was spent on this old jewelry, it always feels good to be not wasting what you already spent. The hardest part is figuring out what to make with all of these neglected baubles. That is where I can help! I came up with a collection of craft ideas that will inspire you to start digging through your jewelry right now. 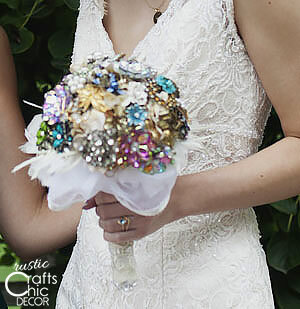 The first idea is a brooch bouquet that I did for my daughter’s wedding. I made a large one for her and smaller ones for each of her bridesmaids. These bouquets could also be made for home decor. My daughter now has her’s in a glass cabinet in her dining room with glassware and it makes such a pretty accent. I didn’t use my own jewelry for this project but did use a collection of my mother in law’s old brooches. I did have to purchase some vintage brooches on ebay to have enough for all of the bouquets but was glad that a large part of my daugher’s bouquet was filled with her grandma’s brooches. 2 stems of silk hydrangea – some of the petals will show through the brooches so choose a color that you will coordinate with your decor or dress. 18″ x 4″ section of ribbon, tulle, lace, or any fabric of your choice for the neck of the bouquet. 1. Attach 3 strands of 12 inch wire to brooches, by the pin. Simply wrap these strands around to the brooch pin a few times to secure the wires in place. You will now have a brooch flower with a three wire stem hanging down. 2. Wrap these three wires together with floral tape to create one thick stem. 3. Insert these brooch flower stems into the silk hydrangea flowers, which act as the base for the bouquet. The hydrangea petals fill in the gaps between the brooch flowers and help to hold together the entire bouquet. Extra embellishments can also be added to the bouquet. I added two optional feather stems along the bottom before wrapping all of the wires together with more floral tape. For the bridal bouquet, I also added a section of the tulle from my wedding dress at the base of the bouquet which also got wrapped around the base with the floral tape. 4. The handle of the bouquet is created by wrapping all of the stems together with lace using fabric glue to secure the lace. The bottom of the handle was finished with the corsage pins that were simply inserted into the bottom of the handle so that just the pearls showed at the bottom. If any of the brooches fit loosely at the top, I added just a touch of jewelry glue to hold them in place. Most were just fine. 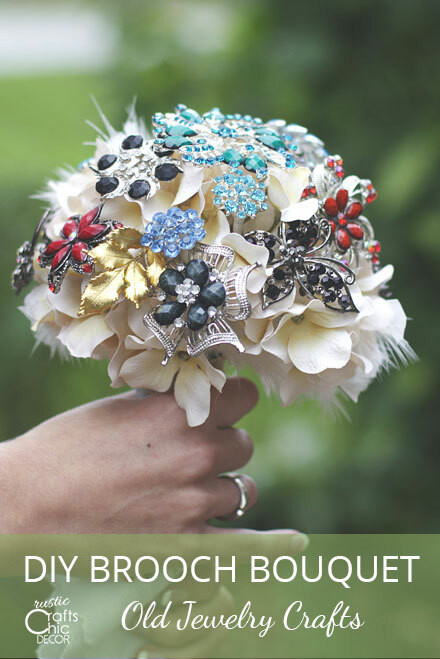 It is a time consuming project but it is a great way to use old brooches and earrings. This idea for what to make with old jewelry can also be very profitable. If you make these to sell, they can go for $300-500 depending on the brooches and detail put into the bouquets. 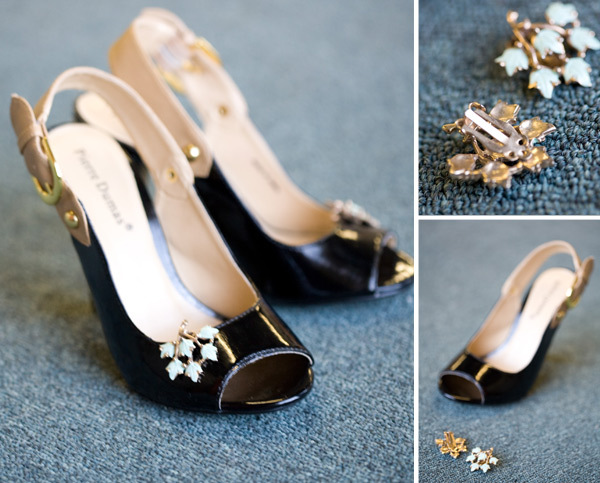 You can add some glitz and glamour to a pair of shoes real quick and easy by clipping on a pair of fancy earrings. 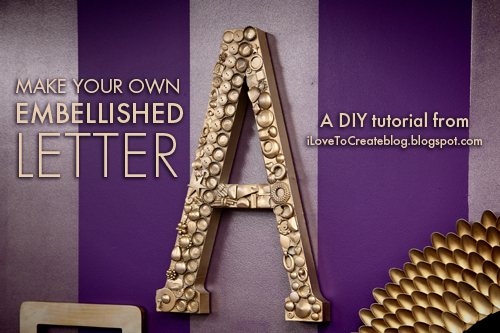 How about making a decorative accent for your home by embellishing a letter with jewels? Spray paint ties the whole design together. 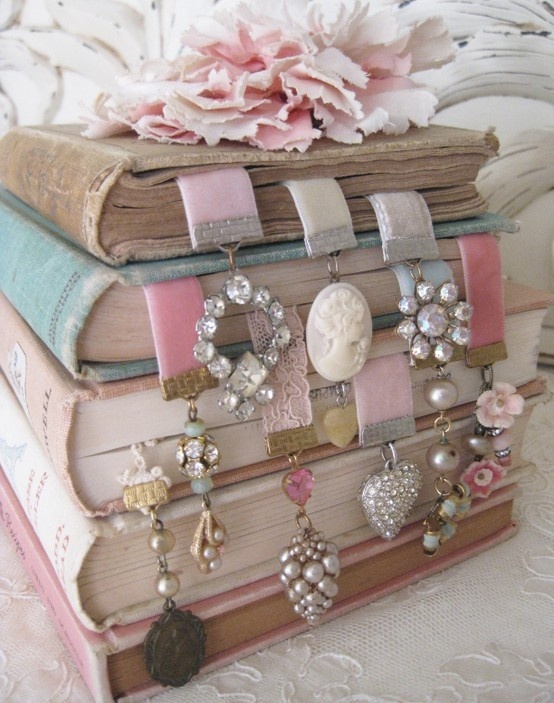 You can always use a decorative bookmark and these are so pretty to look at that you will want to start reading just to use them! Here is another bookmark idea in a clip form. I am a big fan of dressing up furniture knobs just a touch. 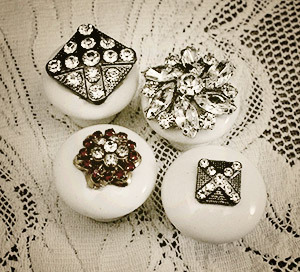 Embellishing knobs with jewelry is a perfect idea for a shabby chic style piece! 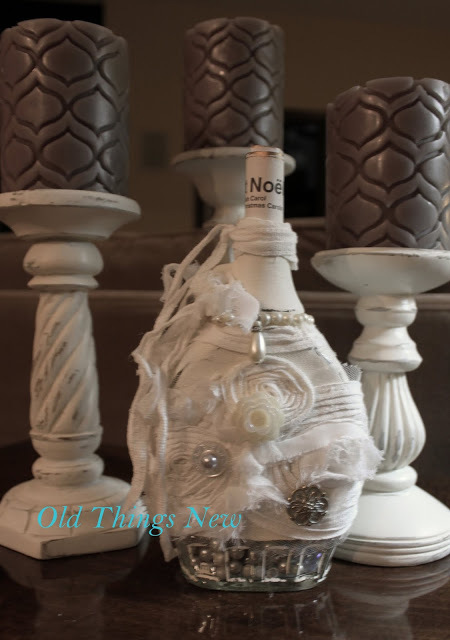 Here an old bottle was embellished with jewelry and fabric scraps. There was all kinds of recycling going on for this project! 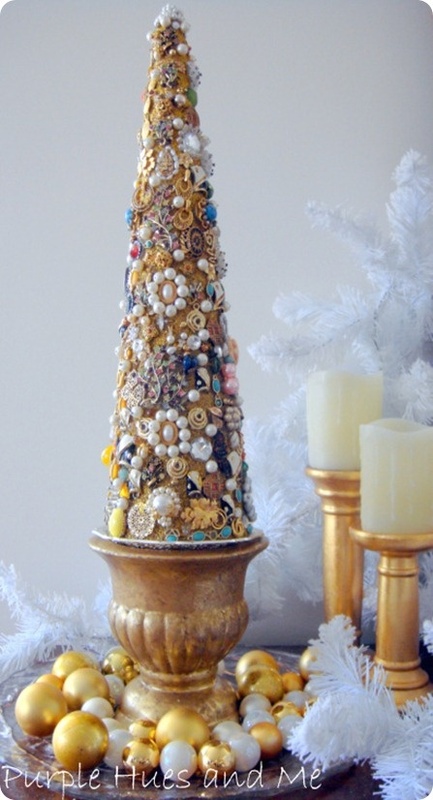 And, at Christmas you can make a dazzling Christmas tree using a styro-foam cone embellished with jewelry. So, those are some creative ideas for what to make with old jewelry. Do you have any ideas to share? About 25 years ago I made a Christmas Tree (for year round decor) out of my broken jewelry and buttons etc. I just this year started tearing it apart for a re-do into something else. It’s seen it’s better days with so many moves. Way back then there wasn’t the internet with it’s wealth of ideas. I just decided to clean out my many jewelry boxes and had the foam tree already and some leftover green spray paint. I will give you this WARNING before you spray paint styrofoam: Unless there is special paint for it now: The spray paint melted the styrofoam! Also meant to say : All of these are beautiful but I especially love the bookmarks and plan on making some for gifts in the future! They will be especially meaningful for my 2 sisters since some of it is from my moms old costume jewelry! Thanks for giving ma a great idea for re-purposing my de-constructed jewelry Christmas tree! I love the fact that you are double re-purposing :)! 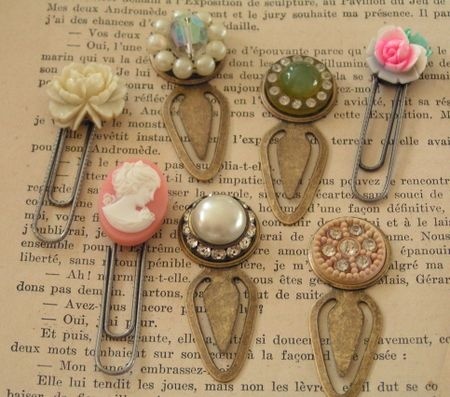 The bookmarks will be a fun way to reuse your jewelry…again! In the 1960’s Christmas tree’s out of broken glass were very popular as well as jewelry tree’s. I make jewelry with old jewelry parts – great ideas and inspirations! just hope I can find the jewellery.